Through its coalbed methane (CBM) projects in China, Far East Energy can exploit total gas-in-place estimated to be 18.3 to 24.9 trillion cubic feet (Tcf). By using an internal estimated recovery rate of 50%, recoverable CBM resources are potentially 9.2 Tcf to 12.5 Tcf (FEEC’s share is 4.8 Tcf to 6.9 Tcf depending upon CUCBM and ConocoPhillips participation). 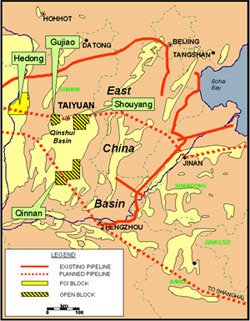 Far East’s partners are ConocoPhillips and China United Coalbed Methane Company (China United). China United is China’s leading coalbed methane company. The FEEC properties are world class in size and potential. The Far East projects potentially contain recoverable CBM resources of 9.20 Tcf to 12.5 Tcf. 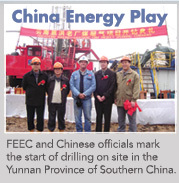 ConocoPhillips has extensive and encouraging information on the Shanxi project. 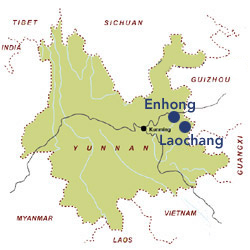 Enhong and Laochang, Far East Energy’s other CBM projects have had extensive coal exploration with drill holes mapping out two world-class CBM prospects. Between these two projects, 1,561 drill holes have been completed, 30 technical reports written, 21 core analyses completed and over 300 other reports on gas concentrations. Internal ConocoPhillips documents state the "coal was well cleated and coal samples have high gas contents." Far East could be a 66.5% owner of this project if ConocoPhillips decides to participate only on an overriding royalty basis. Far East would retain a 40% interest if ConocoPhillips elects to participate, but would only have to put up 40% of the development costs. Core recovery tests by ConocoPhillips indicate high levels of cleating (a very good sign) and friability (brittle and fragmented coal) and the tests also show good gas content. If all goes well, Far East could place hundreds of horizontal gas wells on each of the two blocks. Tests show the amount of gas per ton of coal is 200-500 cu. ft.
All Far East Energy’s projects appear to have excellent potential if the permeability is favorable. The Far East technical team feels relatively confident that this will be the case considering the extensive information already available regarding the fracturing and cleat system of the coal beds. Also, with over 80% of Far East’s coal seams less than 1,500 meters from surface, well completion costs should be reasonable. Comparing Far East Energy’s projects to some of the major CBM producing areas in the U.S. shows favorable economic potential of Far East’s projects based on gas content per ton and size. The Yunnan Coal Geological Bureau and ConocoPhillips have accumulated substantial data addressing three of the four most important factors for successful CBM production in the Far East projects: size of the coal deposit, gas content and thickness of the coal seams are all favorable. For the fourth factor, permeability, the technical information and preliminary tests are uncertain but appear to be somewhat tight. Far East plans to use horizontal drilling technology ("HDT") to enhance the value of its properties in China. HDT has been shown to have a positive impact on CBM development in the United States, particularly in Arkoma and Appalachia. The advantages of HDT are in the ability to stay in the desired zone, control over the direction of the wellbore, limited fluid invasion in the formation, less surface facilities, well productivity exceeding that of vertical well capacity, ability to add additional zones with confidence and less formation damage due to less pressure drop. Although the cost of a horizontal well is expected to exceed the cost of a vertical well, Far East believes that the overall benefits are worth the higher cost per well.